It is a dark time in the universe. Planet after planet is falling to an unholy army of Necromongers -- conquering warriors who offer ravaged worlds a simple choice -- convert or die. Those who refuse their rule hope in vain for someone or something that will slow the spread of Necromongers. But rebels are short-lived and saviors, its seems, are in short supply. When things get bad, weary survivors turn to myths for comfort -- murmured prophecies, vain hopes, legends of good vanquishing evil. But good isn’t always the antidote to evil and legends can be wrong. Sometimes the only way to stop evil is not with good -- but with another kind of evil. 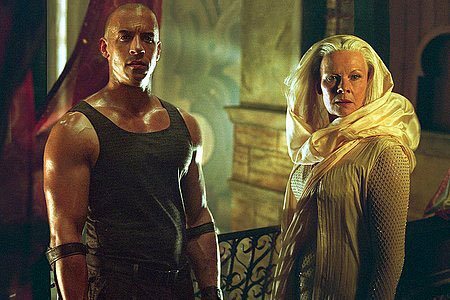 So an unlikely figure is summoned from exile and asked to join the fight: Riddick (VIN DIESEL), who couldn’t care less who’s in charge of the universe, just as long as he’s left alone. Since leaving a god-forgotten (and creature-ridden) planet in the Taurus system five years ago, the wanted fugitive hasn’t looked back. Most of his time has been spent evading capture and ghosting whatever mercenaries are on his tail. To him, it’s all the same, apocalypse or no -- this one-man army is interested only in saving his own life. Get in his way and he’ll gladly take yours. But something has been set in motion, and the coming confrontation propels Riddick into a series of epic, winner-take-all battles: from an idyllic, multi-cultural civilization under siege; to a subterranean prison carved out beneath the surface of a hellish, volcanic planet; and finally, aboard the massive, baroque Necro mothership and the seat of power in their black empire -- the Basilica. In the final battle, it is foretold that the fate of all may depend upon the destiny of one Furyan. And all the power in the universe cannot stop destiny. ALEXA DAVALOS (HBO’s And Starring Pancho Villa as Himself) as Kyra, a young woman whose toughness -- and deadliness -- almost matches Riddick’s. The fugitive had rescued her (when she was a young girl called “Jack”) from the Taurus system planet and re-meets his embittered, abandoned charge now, five years later. THANDIE NEWTON (Mission: Impossible II, Beloved) as Dame Vaako, the carnal, stunning and ambitious partner of a Necromonger commander, Vaako. 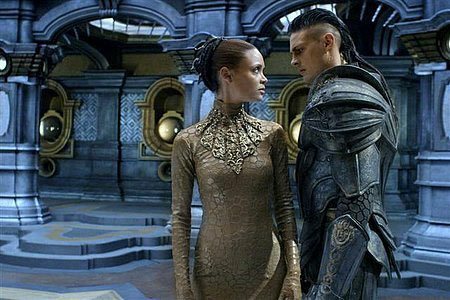 KARL URBAN (The Lord of the Rings: The Two Towers and The Return of the King) as Vaako, the young Necro commander whose loyalty to his leader, Lord Marshal, is sorely tested by his fiercely ambitious wife. COLM FEORE (Chicago, The Sum of All Fears) as the sixth Lord Marshal, the Necro supreme leader, the highest, holiest and deadliest of all known Necromongers. LINUS ROACHE (Priest, the title role in television’s RFK) as The Purifier, a high-ranking figure among the Necros in charge of converting the ranks of the newly-captured. KEITH DAVID (reprising his role from Pitch Black) as Imam, a cleric familiar with Riddick from their previous experiences in the Taurus system. The holy man’s goodness and compassion are rare commodities in Riddick’s universe. YORICK van WAGENINGEN (Beyond Borders) as The Guv, the informal leader of the inmates housed in one of the universe’s worst prisons -- the Slam on the planet Crematoria. NICK CHINLUND (Below,Training Day) as Toombs, a veteran and formidable mercenary intent on capturing Riddick. And one of the world’s most distinguished performers, Academy Award winner JUDI DENCH (Shakespeare in Love, Mrs. Brown, Chocolat) as Aereon, a mysterious ambassador from a rarefied race whose role in the proceedings remains as elusive as her amorphous shape. Giving full reign to their imaginations, Twohy and his accomplished team of creative and technical artists have fashioned an astonishing backdrop on which the explosive story plays out amidst an array of civilizations, including the light-infused Helion Prime, the scorching Crematoria, the icy wilderness of Planet U.V. 6. 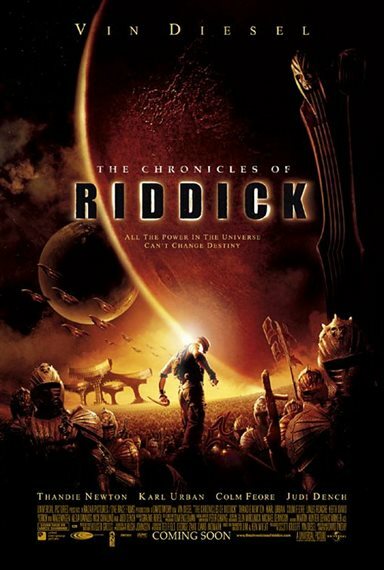 With specially designed space vehicles, weaponry, technology and gadgetry, The Chronicles of Riddick fills the screen with a newly discovered universe. 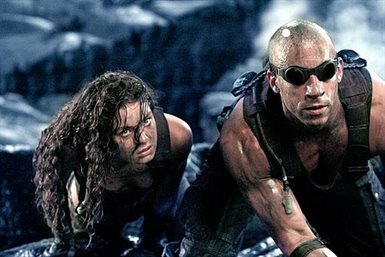 Download Chronicles of Riddick in Digital HD from the iTunes store. 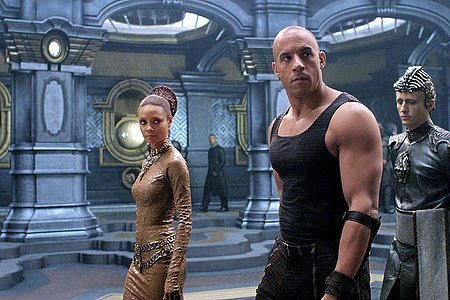 Chronicles of Riddick images are © Universal Pictures. All Rights Reserved. Chronicles of Riddick images © Universal Pictures. All Rights Reserved.